What are the symptoms of Hypothyroidism or Hashimoto's Thyroiditis? How has Thyroid Assist helped others? How do I use Thyroid Assist? Can I use Thyroid Assist along with my prescription medication for Hypothyroidism or Hashimoto's? More than 5 million Americans suffer from Hypothyroidism and as many as 10% of American women may have some form of thyroid dysfunction! Many people have hypothyroidism without even realising it! The thyroid gland is situated at the base of the throat and is stimulated by the pituitary gland to produce hormones which are important for the functioning and maintenance of all the cells in the body and for metabolism. If there is an underproduction of thyroid hormones, hypothyroidism will result. Overproduction causes hyperthyroidism, or overactive thyroid. Hypothyroidism is relatively easily to diagnose by means of a blood test to check TSH levels (the thyroid stimulating hormone produced by the pituitary gland) and T4 levels (the main thyroid hormone). Remember that these levels can vary considerably from individual to individual and what is 'normal' for one person is not necessarily normal for another. Doctors must be sensitive to the correlation between symptoms and TSH and T4 levels in the individual. Because the 'normal' range varies from person to person, some people may have hypothyroidism or hyperthyroidism (and their symptoms), while blood tests show that their TSH and T4 levels are normal. Hypothyroidism is conventionally treated by administering a daily dose of synthetic thyroid hormones (e.g. Levothyroxine). This can often restore healthy thyroid functioning very effectively. One of the main problems with synthetic thyroid hormones is that they may result in too much thyroid hormone in the body, resulting in hyperthyroidism. Another problem is that some people do not have sufficient amounts of an enzyme needed to convert T4 into T3 (its active form). Some doctors therefore prefer to use a form of natural thyroid hormone extracted from cows, which contains both T4 and T3 thyroid hormones. There has been some concern, however, that this form of natural thyroid hormone may be contaminated by harmful viruses. Naturopaths have long recognised that there are very effective herbs that can help to promote healthy thyroid functioning and restore thyroid health. In conjunction with experts in the field, Feelgood Health has developed Thyroid Assist, a 100% herbal remedy to assist in the treatment of hypothyroidism and Hashimoto's Thyroiditis. Thyroid Assist, along with a healthy diet and lifestyle, can help to promote thyroid health and bring relief from many of the symptoms of hypothyroidism or underactive thyroid functioning. Thyroid Assist is a completely natural, non-addictive thyroid remedy that contains specifically chosen herbs to gently balance and harmonize thyroid activity in the endocrine system. Thyroid Assist can help to rejuvenate a sluggish thyroid gland and promote regular thyroid activity - helping to attain balanced metabolism, body temperature, fertility and a healthy weight! "I always felt frustrated about my inability to lose weight no matter how much I tried. Eventually I went to see my doctor who checked my thyroid and told me that it was underactive. He said I would not lose weight because my metabolism was too slow. Since then I have used Thyroid Assist and for the first time I can see the results of my efforts! Also my chronic constipation is a thing of the past, thank goodness." "I have been using anti-depressants for years and years and always wanted to stop taking them. Everytime I tried, I became depressed again, even though there was no real reason. I went from doctor to doctor and had so many different drugs that I lost count of them all. Eventually I decided to go for therapy and thank goodness I went to see Michele Carelse who refered me to have my thyroid tested. I was so relieved to find that I had a hidden thyroid problem which was causing my depression. I have been using Thyroid Assist and Mindsoothe for three months and I feel like a new person. I can get through my day without being exhausted for a change and my depression is completely gone - without therapy and NO MORE anti-depressants!" "You won't believe how I struggled to get out of bed every morning. All the symptoms of hypothyroidism were there - from the depression to the constipation to the weight gain, etc. Even though my doctor said that my thyroid was normal, I just knew that something was wrong. I am going through menopause and they all said that was the cause, but I felt that there was something else going on. I visited a homeopath who told me that hypothyroid is not always detected on tests. Thyroid Assist has made a huge difference to the way that I feel. Thank you so much, I can really recommend it." Fucus vesiculosis, also called Bladderwrack or kelp, is a sea vegetable which is a prime source of iodine - crucial in preventing thyroid problems. It has been used medicinally for thousands of years, especially in Traditional Chinese Medicine. Apart from its beneficial effect on thyroid functioning, it is also used as a metabolic stimulant and can be found in many slimming remedies. When using kelp medicinally, always make sure that it is sourced by a reputable and trusted company. Kelp harvested from the beach or near to the coast may be contaminated with industrial waste, sewerage, lead, mercury or other toxins. Kelp used in Feelgood Health's Thyroid Assist has been harvested only from uncontaminated areas and screened for the presence of toxins and contamination. Avena sativa is derived from the wild oat plant and is a well known restorative and nerve tonic, used to treat depression, low libido and lack of energy, as well as hypothyroidism. More recently it has been shown to be effective in reducing high cholesterol levels. Coleus forskohlii is a well respected and often difficult to obtain Ayurvedic (Indian) remedy, traditionally used to treat high blood pressure. It also acts to stimulate the thyroid to release thyroid hormones and is therefore beneficial in the treatment of hypothyroidism. 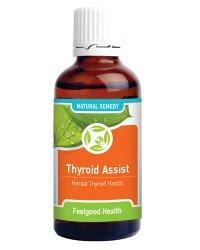 Thyroid Assist is a concentrated tincture which comes in convenient drop form. The therapeutic dose is approximately 15 drops in a little water or juice, three times a day. One bottle lasts approximately one month. Caution: Not recommended for people with low blood pressure or peptic ulcers. Safety during pregnancy and breastfeeding has not been established. Yes, you can. However, using Thyroid Assist may mean that you will need less of your prescription medication and it is therefore strongly recommended that you ask your doctor to monitor thyroid functioning and adjust the dosage of your prescription medication if necessary. Results may vary, due to a number of influential factors. Over time (usually 3-6 weeks) Thyroid Assist will act in a supportive capacity to a healthy endocrine system to support thyroid health. Some individuals respond sooner than others with best results achieved when Thyroid Assist is used consistently. One bottle of Thyroid Assist at full adult dosage (15 drops three times daily) will last approximately 30 days. Eat plenty of iodine-rich foods such as saltwater fish, shellfish and sushi. Make sure that your multi-vitamin includes Vitamin C, all the B vitamins, zinc and copper. Avoid cigarettes - researchers have found that smoking significantly increases the severity of hypothyroidism. Because Hypothyroidism is often associated with depression and fatigue, we have put together two Thyroid Combo Packs to save you money and for maximum symptomatic relief. Hypothyroidism and Depression Combo Pack: Order Thyroid Assist along with our Mindsoothe Capsules containing St John's Wort and Passiflora in therapeutic dosage. Hypothyroidism and Fatigue Combo Pack: The chronic fatigue and lethargy that often accompanies Hypothyroidism makes these two remedies perfect companions! Order Thyroid Assist along with our very successful Fatigue Fighter, containing Eleutherococcus senticosis, Centella asiatica and Olea europea.